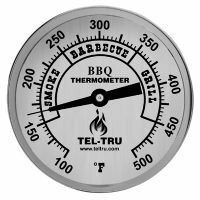 The Tel Tru BQ300 BBQ thermometers have set the bar for all the other pit thermometers on the market. Highly accurate, high quality and made in the USA. The BQ300 series are available with a wide variety of dial faces and in 2.5 and 4 inch stem lengths. Tel Tru BQ300 BBQ thermometers are all made on the same basic frame with 3 inch dial faces. 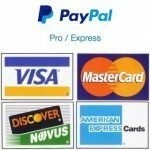 These are some of the most accurate smoker thermometers you will find on the market today. 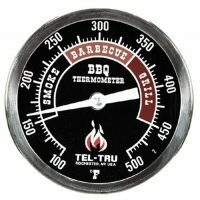 Tel Tru actually makes all kinds of industrial thermometers and they bring that knowledge to the bq300 product line. These are bi-metal analog thermometers made to mount on the door or sides of most smokers. 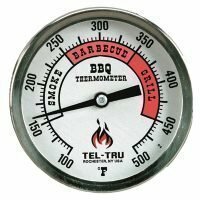 All of the Tel Tru bq300 bbq thermometer mount into a 3/8″ hole. If this sounds large to you that is because it is. Most higher end off-set smokers already have this size mounting hole on them and it is just covered with a plug, some are even threaded.